We'll look at some more reasonably priced Z390 boards soon, we promise, but third through our door was Asus' ROG Maximus XI Hero (Wi-Fi) that, unlike MSI and Gigabyte's recent additions, has a long-standing naming tradition stretching back down a line of generally excellent motherboards, often marking one of the cheaper entry points into the costly ROG universe. Like most things Intel this year, prices are certainly not cheaper than they were last generation, and the latest Hero will set you back around £300 with Wi-Fi and £280 without it. However, Asus has done a pretty good job of making this the most desirable Hero ever. For starters, we're big fans of the RGB lighting here, and those etched lines and diagonal patterns look great whether you go for RGB rainbow or a more traditional static red for more of a ROG feel, and you get the usual three-pin addressable and four-pin 12V RGB headers as well. 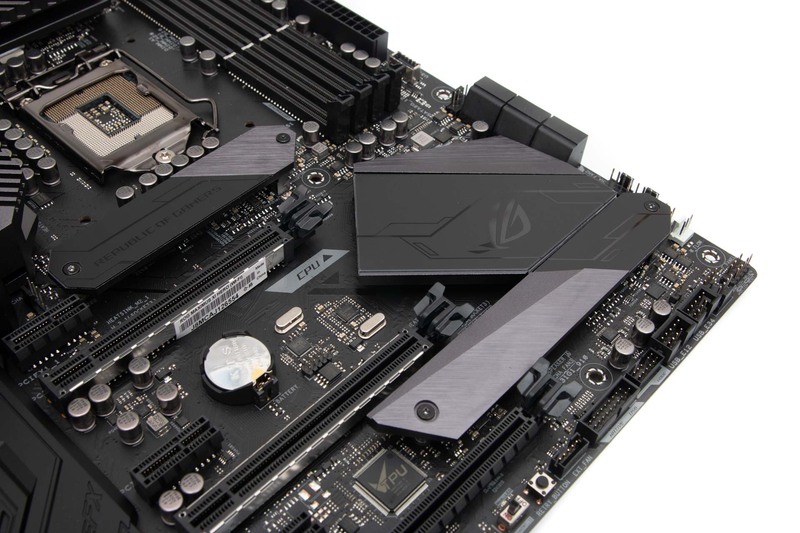 It's certainly very good looking and moody, although Gigabyte's Z390 Aorus Master is likely to turn one or two more heads thanks to its trio of shiny M.2 heatsinks. There's plenty to get excited about here, though, with two large heatsinks for the Hero's own pair of M.2 ports plus plenty of overclocking and testing tools with power and reset buttons as well as an LED POST code display on the PCB, not forgetting also USB BIOS Flashback and CMOS clear buttons on the rear I/O panel. The board features some sizeable heatsinks linked with a heat pipe underneath which sits an 8+2-phase power delivery with the former coming from four PWM signals and eight power stages along with high and low side MOSFETS - a slightly different method to other boards we've seen but just as effective as we shall see. The M.2 heatsinks were a tad fiddly to deal with, as they're simply screwed into two small columns allowing them to straddle the SSD. We used the one closest to the bottom of the board to try to get the best cooling results and found a drop of 15°C between load temperatures using our Samsung 960 Evo SSD. It's definitely worth using so long as your SSD has components on the top side, although it's clearly not as lavish as MSI's dual-sided heatsink on the MEG Z390 Ace. 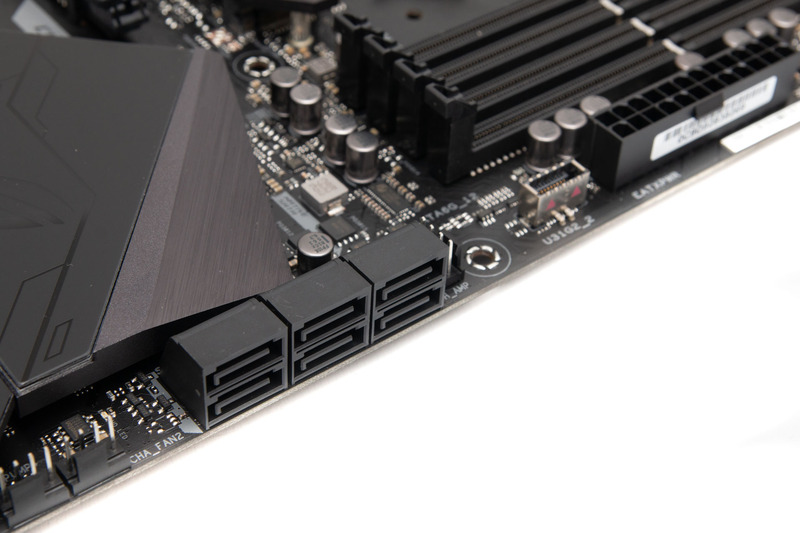 You get the standard six SATA ports, so unlike older Hero models, Asus isn't offering an additional two ports for its ROG board, but that was one of the advantages it had over the old Ranger board anyway - now it just has the Strix range snapping at its heels, and besides it also has two M.2 ports. You get an Intel-powered Type-C header on the board too for compatible cases along with a Type-C port on the rear I/O panel. We're pretty sure Asus was one of if not the first to do integrated I/O shields with the Rampage V Edition 10, which was obviously a super-premium motherboard, but it's fantastic to see this finger-mangling necessity fixed to lower-end boards, and it's great that MSI and Gigabyte are following suit too. Our model was equipped with Wi-Fi and has the usual aerial mounting points in the panel and included aerials, but you can save around £20 by opting for the non-Wi-Fi model. You also get the standard audio ports for the ROG Supreme FX S1220 Realtek-based audio, a reasonable but not stellar count of seven USB Type-A ports of which three are USB 3.1 Gen 2, and - always useful for diagnostic purposes - a pair of display outputs.